A month has gone by so fast! London was amazing. It really was an Interesting, Intriguing and Inspiring trip. I guess the hardest part now is to put all the experience into action. December is here again, a time for me to reflect and anticipate great things ahead. 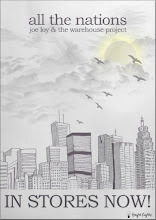 Bus Company Single - "For Heaven"
This is a great tune guys!, we just finished the single in June and would probably be out year end. Stay tuned. Meanwhile here's a little acoustic doddle tastefully done by Sam on the floor- literally.. enjoy! This brings back sweet memories of the whole production of this movie. Am truly humbled to have been part of it. In Loving memory of Yasmin..
Sweet memories of the Studio Recording for Love Came Down. Thank you so much, you guys you were an amazing bunch. 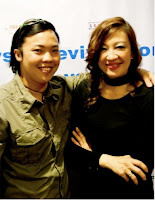 Talentime the latest screenplay By Yasmin Ahmad. For those who have been wondering "where did joe disappear last Sept till Oct". Talentime was the reason. Workin with Yasmin, Pete Teo and the whole cast and crew was "Power man! It was an amazing experience having to edit the sound, edit and prep the soundtracks and creating the sound design was fun too! Enough said!, be sure to check our Talentime. Hey Guys!, Keep tuesday nights free! 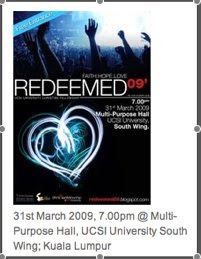 (31st March 2009) Am very exited to be doin a few numbers at Redeemed!, an event form Sedaya's very on CF!.. Hello everyone!.. I really am exited to start blogging this time round. I guess its the excitement of being in a new season and experiencing God in a new way really overwhelms me. It's also great to finally be married! (I know many of you would agree) and Yes!, life is beautiful!, that summarizes it very nicely :-). Am working on a freelance basis these days, meaning I'd work on production and recordings on a project basis. I must say it has been very fruitful. Not only I'd finally have control of my schedule and working with different bands has been a blast. 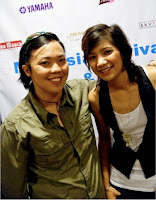 The latest would be the single entitled "THE WAIT" from the MRSC winners FREE TO FALL. They are currently my favourite "All-Gall" band. Check them out at www.freetofallmusic.blogspot.com I really had a great time Co-producing the track!, Blasting guitars and a newly inspired "starbucks-song" by Jane Sebastian was part of all the fun, Ha ha. Will be posting up pics very soon!. I'm getting all prepared to get married . . . Yes I'm back!... the train of events of the past few months have finally been Re-juvenated. Thanks to the amazing caretakers of Arundel & Bunge, Fraser's Hill (Ee Lane & jon included). The Food!.. THE FOOD MAN IS MADNESS!. HA HA.Gonna name them in Chronological order. Hainanese style, reminiscence of Grandma's famous recipe with secret chilli sauce. Not as bad as it sounds, I guess they should have named it better those days to safe guard its true nature ....to serenade our tired bodies form the winding trip. Fuyoh!, the name itself is bombastic, Sedap! Seriously guys!... how to describe this one?.. we just went "Mmmm Mmmmm". I think we've been tricked by believing that apple crumble should be hard and stiff, this one is soft, fully loaded with custard. Once eaten you should be the one that's crumbling! Char-Mee-Hun somemore!.. woo-hoo!!.. how la not to put on weight? I guessed you might alraedy be feeling really full after reading all this. All in all it was the people we spent over the 'makan' table that really made the difference! 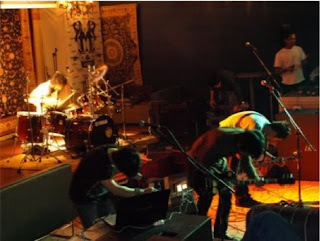 'ALL THE NATIONS' on OCTOBER 11th 2008 at FGA KL! so block your dates for that day! It's gonna be worthwhile! Love God, Love people, Love music...Love FOOD!! !